Working in procurement and sourcing is not for the faint-hearted. While we may be one moment presenting to CFOs and driving change within the organization, the next it seems we’re having to remind our stakeholders that we exist by prompting them to use the contracted suppliers to eliminate rogue spend. What drives this perceived change in the importance placed on the procurement function and how can we combat it within the organization? 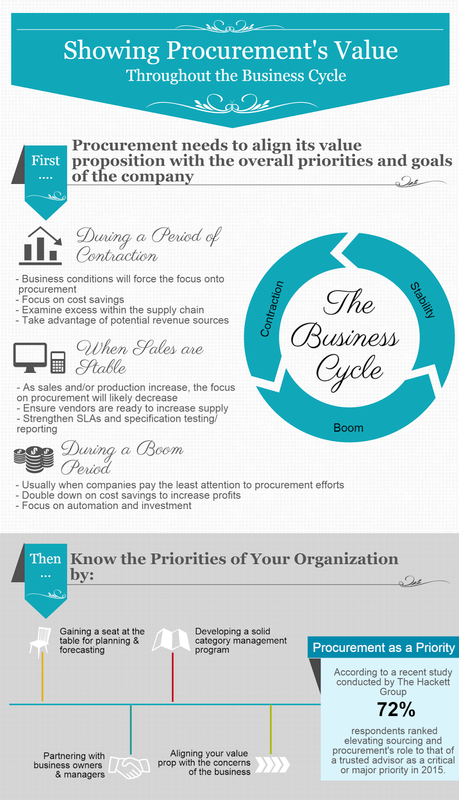 As a company moves throughout the business cycle, it is very typical for the focus and priority placed on the procurement department to ebb and flow. To successfully portray the value of the department through any and all business conditions, procurement needs to align its value proposition with the overall priorities and goals of the company.